OREGON CITY — When Jacob Zakharyuk's first two shots from beyond the 3-point line missed the mark, the Damascus Christian junior feared the worse Tuesday night. Then he got a couple of shots to drop and it was game on. 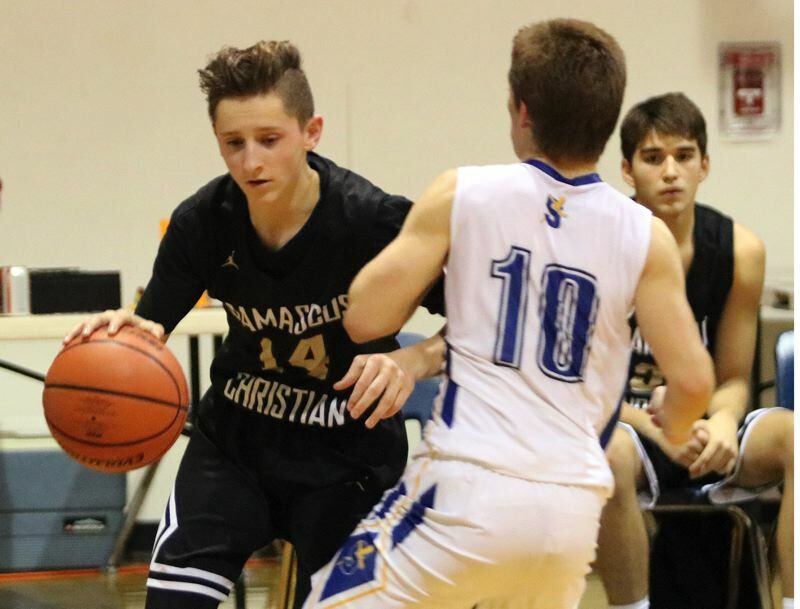 Zakharyuk knocked down five 3-pointers and finished with a game-high 20 points, leading the Eagles to a 52-43 Valley 10 League boys' basketball win Tuesday at North Clackamas Christian. Jason Budey also scored in double figures for Damascus with 12 points to help the Eagles (9-1) extend their winning streak to five games and take over sole possession of first place in the league standings. "I'm glad we got the win," Damascus coach Brad Patrick said. "It's always a battle with North Clackamas no matter what our records are or level of experience. Whenever we come in here, we know we're in for a battle."? 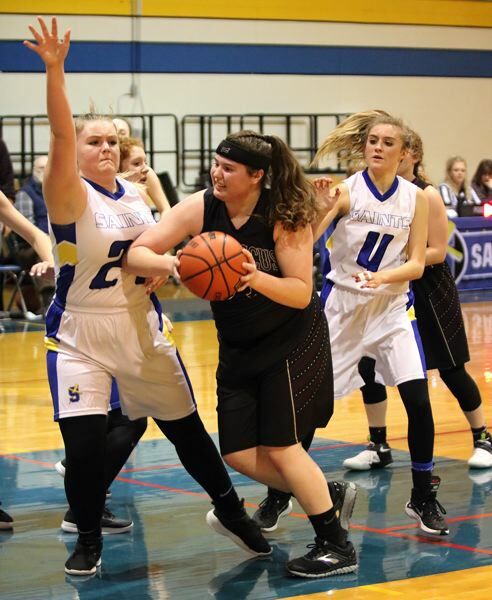 Tuesday's game featured seven ties and six lead changes before Sam Tichenal hit a 3-pointer from the left wing to draw the Eagles into a 25-25 tie with 2:15 to play in the second quarter. Budey then made one of two free throws with 1:10 left in the half and Zakharyuk added a 3-pointer – his third of the game – to send the Eagles into halftime with a 29-25 lead. "At first, I missed my first two shots and I was like, 'Ah, man, I'm going to be off this game,'" Zakharyuk said. "But then I hit one and then another, and then I was feeling it." Zakharyuk, the first player off the bench for Damascus on a night when three other Eagles were slowed with flu-like symptoms, puts more arc on his 3-point shot than just about any other player in all of Class 1A boys' basketball. "Last year, I was shooting kind of flat," he said. "People said to put more arc on it and I just over-exaggerated on it. And my shot is pretty fast, so I'm able to shoot it quick." His shot proved to be a potent weapon on a night where North Clackamas chose to stay in a 2-3 zone most of the way. "We've either played man-to-man or a 1-2-2 zone, but after scouting Damascus we didn't like either one of those defenses against them," Saints' coach Grant Nelson said. "I like how our 2-3 worked, with the exception of No. 14 (Zakharyuk) draining whatever he wanted to." Damascus never trailed in the second half, and in at least two instances when it looked as if North Clackamas might mount a threat, Zakharyuk hit shots to give the Eagles some breathing room. First, he drained a 3-pointer from the right win in the final minute of the third quarter that pushed the lead to 39-33. Then he drilled another trey from the top of the arc and followed that with a lay-up off a Saints' turnover to make it 46-36 with 5:49 to play in the fourth quarter. "He's a crazy scorer," Budey, the senior post, said of Zakharyuk. "He comes off the bench and he's always ready to play his hardest and he's always ready to score. He knows his role on the team and we definitely needed that tonight." North Clackamas came up empty on its next six possessions while three minutes ticked off the clock. 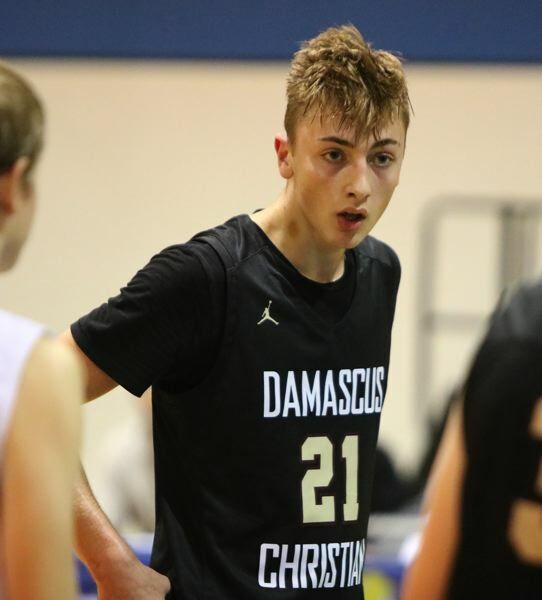 Damascus Christian (52) — Jacob Zakharyuk 20, Budey 12, Powers 9, Shields 8, Titcheral 3, Bogdan, Nelson. North Clackamas Christian (43) — Braden Young 16, Nelson 3, Matias 8, Minne 4, Van Lieu 5, Stark 7, Horn. Damascus Christian's Tory Webb scored a game-high nine points, grabbed 13 rebounds, and anchored a spirited defensive effort that carried the Eagles' girls' basketball team to a 35-12 Valley 10 League road win Tuesday at North Clackamas Christian. It was the Damascus defense that dictated how the game would play out, as the Eagles (7-1) won their fourth in a row. "They followed the game plan pretty close," Eagles coach Dave Wakefield said. "We really concentrated on our defense this game, not so much the offense, because with a young team, you're going to ebb and flow with the offense, but the defense can always be solid throughout the whole game." Damascus jumped out to 20-3 halftime lead, holding North Clackamas to 0-for-21 shooting from the field and 3-for-4 shooting from the free-throw line with seven turnovers. The Saints were held scoreless until the midway point of the second quarter. With a roster that has only one senior (Webb), one junior (Ally Love), and the rest sophomores and freshmen, Wakefield has been impressed with the progress his team has made since the Nov. 28 season opener. "I'm actually kind of shocked, because I know how much youth I have on this team," he said. "As for the physical part of the game and in terms of maturity, I feel we're ahead of the curve a little bit, but you're hesitant to say too much, because the next game we might lay an egg." Damascus Christian (35) -- Tory Webb 9, Emily Powers 8, McKenna Patrick 6, Ally Love 6, Savannah Hale 4, Melissa Manning 2, Watts, Wakefield, MacGibbon, Titchenal. North Clackamas Christian (12) -- Esmaya Hendrickson 4, Kelsie Pitzi 3, Alexis Donovan 2, Maddi Pitzi 2, Dana Dale 1, Lay, Hofer, Meuser, Zook. This Damascus Christian doubleheader story is slated for our Friday, Dec. 21, print edition.